– 5/6/17 – writeup by Linda Desjardins. The NECC Campus Classic fielded seven striders: Kate Gage, Marianna Kay, Halyna Kay, Cheryl Welsh, Linda Desjardins, Armand Claveau and Jenny Reynolds. We represented well and had many trips to the medal podium. Let’s start with Kate Gage – THE FIRST WOMAN OVERALL! What an accomplishment! Next in was Marianna Kay, another first place finish for her in the 0-14 age group, followed by Halyna Kay, placing second in 40-49. The next Strider was Cheryl Welsh, taking third in the 50-59 age group (and she’s at the top limit of that group), then Linda Desjardins was awarded first in 60-69 (another top limit in the age group, but the fastest woman in that group was the third woman overall so Linda got age group first by default). Kate, Cheryl and Linda were especially excited to have earned medals as all three ran Boston 19 days earlier and were running on still-tired legs. Armand Claveau took third in the 70-79 division, and Jennie Reynoldsfinished strong (with a little cheering help and running company from her friends on the last tenth – though she didn’t need it). Jenny had been sick all week and ran on pure guts. The course was familiar, scenic, had a nice variety of hills, flat spots and visual interest as spring flowers and buds and the color green predominated. The weather was iffy with off and on rain. Fortunately, the rain stopped just before we started and resumed just after awards were presented. The post-race accounting was one s-l-o-w process. After a run, standing around for a long spell invites chills to set in quite easily. 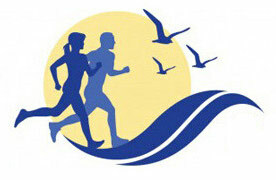 However, six awards for members of the North Shore Striders had a pronounced warming effect. Note from NSS Bureau of Investigations: All times listed are gun times. According to a highly reliable source, runners like Cheryl and Linda had run times that were really 10-12 seconds faster than the gun time listed. Armand and Jenny probably had even bigger differentials between their actual run times and their published gun times.